Scott, D. and Magnisali, E. 2017. Kalla: Robotics and Advanced Composites in Architecture. 26th International Union of Architects World Congress. Seoul, Korea 03 - 10 Sep 2017 International Union of Architects. Scott, D. and Magnisali, E.
KALLA is the outcome of research conducted in the Architectural Robotics Lab of the University of Westminster, focusing on advanced composite materials and the concept of topology optimization, and the expertise of Affan Innovative Structures LLC on advanced composite structures fabrication. 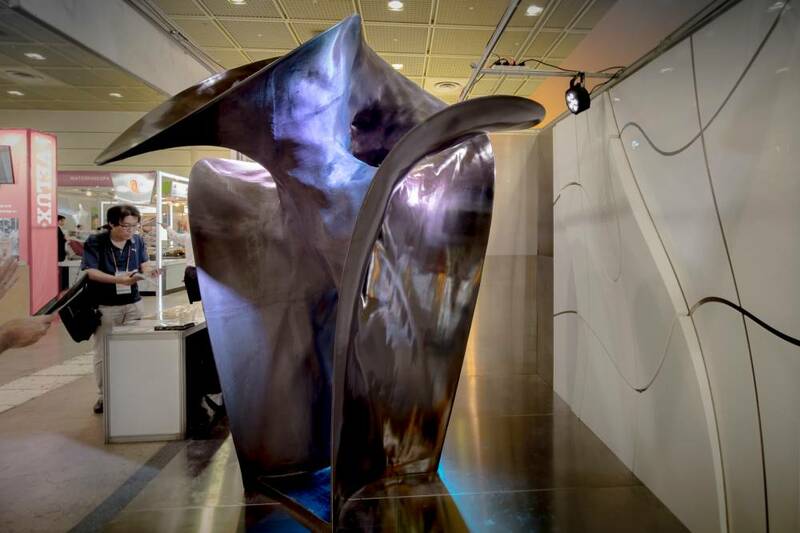 The form follows an iterative design process, focusing on the study of mathematical surfaces. The result of this investigation, a triply periodic shell structure, was then subjected to topology optimization, referring to the minimal material distribution on given shells according to applied stresses. Applying this concept to the KALLA project, the shell was structurally analysed and optimized topologically in order to minimize the use of material, while maximizing the strength of its thin surface. The result of this process was the variable extrusion of the shell’s surface, which generated ‘ribs’ of material reinforcement on the back side of the mathematical surface. In parallel, in an attempt to compare, inform and complement the industrial fabrication process of foam mould milling, research on an alternative to robotic hot-wire cutting was conducted. A distorted wall was designed, inspired by the transversal section of the KALLA shell, and after a panelization study, every separate element was robotically fabricated and industrially finished. The result was extremely light-weight, easy to transport, very cost efficient and easy to assemble. The main focus of this ongoing research is to identify possibilities of enhancing the current fabrication methodology of advanced composite materials, by introducing industrial robotic arms in the manufacturing process. We aim to create a novel design-to-fabrication workflow, able to take maximum advantage of the material system’s potentials. Scott, D., Zvirgzda-Zvirgzdina, K., Olendra, M. and Morgan, J. 2017. FAB FEST ’17 - International Fabrication Festival . Scott, D., Zvirgzda-Zvirgzdina, K., Olendra, M. and Girardin, F. 2017. FAB FEST – International Fabrication Festival. Anderson, J. (ed.) Architecture Connects, AAE 2017 Conference. Oxford Brookes University 06 - 09 Sep 2017 association of architectural educators (aae). Scott, D., Zvirgzda-Zvirgzdina, K., Olendra, M. and Girardin, F. 2017. FAB FEST: The Fabrication and Exploration of a Pop-up City. 14th Architectural Humanities Research Association Conference: Architecture, Festival and the City. Birmingham City University 16 - 18 Nov 2017 AHRA. Scott, D., Lancaster, E., Zvirgzda-Zvirgzdina, K. and De Cogan, R. 2016. Introduction to Making Online through eLearning. Scott, D., Lancaster, E., Zvirgzda-Zvirgzdina, K. and Olendra, M. 2016. FAB FEST.